Yaesu FT1 uses 12.5 kHz digital modulation mode C4FM FDMA for high-speed data transmission, reliable and stable voice communication in comparison with analog signal. The digital mode provides data transfer at a speed of 9.6 kb / s.
1. Voice mode + data transfer mode (V / D) - voice and data communication mode simultaneously. This mode allows you to transmit your location data and identification data while working with the correspondent. 2. The FR transmission mode uses the maximum data transfer rate. This mode allows you to transfer large amounts of data, text messages, images, voice data twice as fast as in V / D mode. 3. The FR mode of voice communication uses the maximum speed for the transmission of voice data. This mode allows you to send a cleaner, high-quality voice signal. 4. Analog mode is a normal FM mode that allows you to communicate with all VHF / UHF analog radio stations. 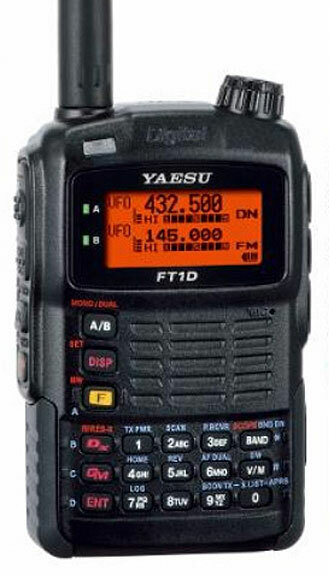 The Yaesu FT1 has a GPS module, an APRS function and a Digital Group Monitor, and is capable of transmitting its location and identification data. Digital technology C4FM FDMA is characterized by a low percentage of errors and data loss, which allows for communication over long distances and with high quality.